On September 11th 2016 the Dybów Castle hosted a historical festival „History still alive – from the Christianisation of Poland to the Second Peace of Thorn”. Amidst the scenes recreating events from the history of Poland and the relations between the Kingdom of Poland and the State of the Teutonic Order, duels of knights and concerts of Medieval music we presented the research, discovery and reconstruction of Nowa Nieszawa. A couple of hundreds of people that visited the exhibition about the archaeological research had a chance to learn about the newest findings concerning the forgotten Medieval city. The organizing party of the festival was the „Zamek Dybów i Gród Nieszawa” Foundation („Dybów Castle and City of Nieszawa”), which leases the Dybów Castle from the City of Toruń and which actively supports actions aimed at restoring the memory of the former, Medieval Nieszawa and its role in the history of Poland. Due to the publication of the book „W poszukiwaniu zaginionego miasta: 15 lat badań średniowiecznej lokalizacji Nieszawy” (In search of a lost city: 15 years of research of Medieval location of Nieszawa) we would like to present the table of contents of the book and its technical details. As reported earlier, the work on the publication about 15 years of search for the Medieval first location of Nieszawa is being completed. Beside the historical documents query, reports on excavations, aerial survey and documentation, and non-invasive geophys survey a brand new digital reconstruction of the Medieval settlement has been prepared. The new digital model of medieval Nieszawa has been created by J. Zakrzewski and S. Rzeźnik and is based on current state of knowledge about the spatial organisation of the city. Presented below are few samples of the digital model that give a taste of the upcoming book „In search of a forgotten city: 15 years of research of the medieval location of Nieszawa”. The publication summarizing the past 15 years of research that led up to the discovery and reconstruction of the forgotten medieval city of Nieszawa is being completed. The monograph publication represents all aspects of research conducted in the past decades, ranging from test trenching, through long-term aerial observations, and finally geophysical prospection. The publication was financed by The Polish Ministry of Culture and National Heritage. The cover of the book is presented below. Research on the medieval location of the town of Nieszawa has been intermittently undergoing for 15 years. Archaeological surveys in 1999-2001, aerial prospection during 2001-2014 and geophysical prospection in 2012-2014 helped to locate, identify, and virtually reconstruct the structure of the city. At the same time the existing research has yet not been assembled and arranged in the form of a single publication, which would present the state of research of the site. In 2015 The Polish Ministry of Culture and National Heritage awarded the Łódź branch of the Scientific Association of Polish Archaeologists (SNAP Łódź) with a grant to publish a monography describing the non-invasive discovery of the medieval city. Project entitled “In Search of the Lost City: 15 years of research of medieval Nieszawa” (04531/15) will summarize the current knowledge of the abandoned medieval town of Old Nieszawa, including an analysis of historical, archaeological (excavation) sources with regard to interpretative models created on the basis of non-invasive prospection. Old Nieszawa (1425-1462) was a thriving metropolis on the border of the Polish Kingdom and the Teutonic Order. As a result over the 35 years of town’s existence it became the main competitor of the Hanseatic League member Torun (Thorn), rivalling and taking over the strategically important Vistula river trade. The effort behind the foundation of Nieszawa reflected in the spatial organization of the city was aimed at precise creation of a powerful trade centre. The existence of a relatively well-preserved remains of the fifteenth-century town shows its uniqueness, and the potential of future research capabilities enhancing the understanding of its contemporary times. The town functioned for less than four decades, and after its destruction the area was relatively free of modern urbanization processes. The discovered remains, that witnessed an important part of the Polish-Teutonic conflict present themselves as a real „time capsule”. It is possible to enhance the knowledge of the historical realities and broaden the awareness of the nature and meaning of the events described in the historical sources. The site is valuable from the point of view of the history of the Polish state, but also because of the size and role played in the history of the conflict with the Teutonic Order. The monograph publication about Old Nieszawa is considered as a culmination of work that allowed to reconstruct the hypothetic shape of the victorious medieval city and brought it back on the map of medieval Poland. The publication will be aided by the existing researchers, as well as specialists fomr the fields of medieval architecture and urbanisation. The publication is scheduled by the end of 2015. In 2014 the Scientific Association of Polish Archaeologists, Łódź branch (SNAP Łódź) carried out a research project “From Nieszawa to Dybów – non-invasive prospection of the archaeological landscape between Mała Nieszawka and Dybowski Castle” (4965/14) located in the area between the Commandry castle in the Mała Nieszawka and The Dybowski Castle in Toruń-Podgórz. The project was supported by the Ministry of Culture and National Heritage Cultural Heritage program. The concept of the project involved the recognition of a range of threats and the internal spatial structure of the archaeological sites without the need for destructive excavation activities. The study consisted of an application of non-invasive prospection and documentation techniques such as aerial photography, LiDAR data analysis, archival photographs as well as multi-method geophysical and geodetic measurements. Geophysical anomalies indicated the existence of fortification relicts, registered on a trapezoid outline with longer sides of approx. 170 and 140 meters and shorter of approx. 110 m long embracing an area of 1.7 ha. South and west side of the defence works has been registered at full-length, while the northern and eastern only partially. This is because of the inaccessibility of the area due to modern development. In addition to the anomaly interpreted as the main outer fortifications there are two adjacent zones registered to the west. They are indicated by a linear cropmark and magnetic anomaly and suggest transformations and use of the area in the past. The results also reveal that the captured remnants of fortifications in the Mała Nieszawka probably have the form of negatives or preserved foundations and lower walls encircling the castle and possibly continuing in an easterly direction (present area of farm buildings) and the west (into the fields). 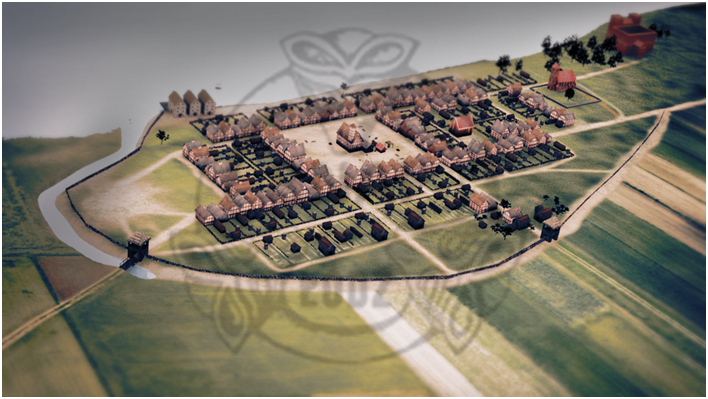 The commandry castle had a complex system of fortifications, characteristic for Teutonic castles from this period, covering the area of approx. 2 ha. It was surrounded by a moat aided from outside by a fortified wall. On the north side a partially overbuilt ward was located, with presumable adjacent utility zones to east and west. Magnetic measurements in the vicinity of Old Nieszawa city’s location site (referred to in historical sources as the New Nieszawa town) on the course of 3 years of the project covered over 36 hectares on the stretch over 1.6 km. Research in 2014 consisted of additional geophysical measurements in the available areas near the flood embankment and by the tree lines, in areas previously inaccessible due to farming and the whole of available area west of the city’s location. Geophysical survey of the archaeological landscape allowed to circumscribe the theoretical spatial framework of environment in which this medieval town existed and prospered. Moreover, thanks to the topographic analysis it was possible to trace the course of the shoreline of the old bed of the Vistula and the areas of alluvial material accumulation. Analysis of the geophysical prospection results allow to supplement the current image of the identified settlement structures. Their further interpretation allows to recreate the features of the city in the immediate vicinity in which smaller historically certified settlements clusters existed. Together they formed a system of social interaction within this medieval micro-region of Vistula’s river course. Nieszawa played an important role in transit, due to its location, consciously compelled in rivalry with Toruń. In 1440 the city already has exported more grain than Toruń, which was brought here by land from the territory of the Polish Kingdom and shipped further by the river to Gdansk. Registered geophysical anomalies, generated by destructs of a fifteenth-century urban organism reveal a detailed plan accompanying the town’s founding. It presumably was based on an elaborate construction plan, set size of the lot, precise deployment of municipal and religious buildings and took in account the need of communication with the surrounding area. Nieszawa was a city covering approx. 22 hectares composed probably of eight districts of buildings. The city existed for only 35 years, but its remains form a priceless time capsule that allows to study and explore one of the key locations for the period of the conflict between the Polish Kingdom with the Teutonic Order. Polish Ministry of Culture and National Heritage has given a grant to Łódź branch of the The Scientific Association of Polish Archaeologists for the project Od Nieszawy do Dybowa – nieinwazyjne rozpoznanie krajobrazu archeologicznego pomiędzy Małą Nieszawką a Zamkiem Dybowskim / From Nieszawa to Dybów – non-invasive study of archaeological landscape between Mała Nieszawka and Dybów Castle (4965/14 – “Ochrona zabytków archeologicznych” priority of the “Dziedzictwo Narodowe” programme). The project is aimed at recognition of archaeological landscape of the area in proximity of the Teutonic Order’s castle in Mała Nieszawka and also at conducting additional research at Nieszawa’s second location with the means of modern, non-invasive methods of prospection. This research will apply a wide range of modern and diverse non-invasive techniques, including geophysical methods, aerial photography, LIDAR data, field measurements with application of GPS RTK and creation of a numeric terrain model and data archiving in GIS environment. First historical information about Nieszawa comes from 1230 C.E., when Konrad I of Masovia gave the Teutonic Order a castle located there. On the basis of a wood-dirt construction, the Order built a fortified castle on the left bank of the Vistula river. The castle became the seat of the Komtur as the most southern outpost of the Order. In 1410 the castle has been taken over by Polish king Władysław Jagiełło during war with the Teutonic Order (1409-1411) and was the place where the treaty signed later in Toruń (Peace of Thorn 1411) has been formed. The settlement and the castle were razed to the ground around year 1424, after signing of the Treaty of Melno and the population moved closer to the Dybów Castle – to the area where medieval Nieszawa was discovered and reconstructed. Not much is known about the initial settlement below the Teutonic castle, beside that it is attested in historical sources. An attempt to fill this gap in history will be made by archaeologists with application of non-invasive prospection. 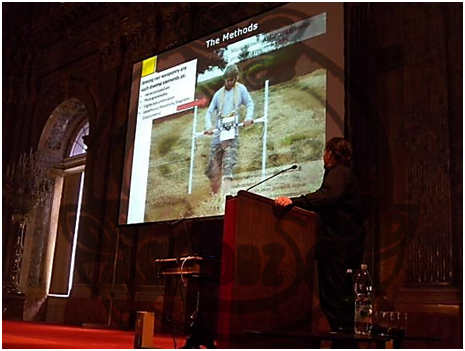 The research of the location of 15th c. Nieszawa has been awarded during 10th International Conference on Archaeological Prospection – Archaeological Prospection 2013. The conference taking place in the building of Austrian Academy of Sciences in Vienna on 29.05-2.06.2013 was organised by International Society of Archaeological Prospection together with Ludwig Bolzmann Institute for Archaeological Prospection and Virtual Archaeology. Presentation of results of the study of Nieszawa by P. Wroniecki, M. Jaworski, M. Pisz, S. Rzeźnik and W. Stępień titled Nieszawa: a forgotten medieval city in Poland discovered with the use of remote sensing techniques was awarded Best Paper Award – first such award given by Ludwig Bolzmann Institute.